Project Hard Rock Bear was an idea that I started when I was in University and after more than 10 years, I am glad that it has finally come to an end. It all started when a friend gave me a HRC bear when she was on vacation. Then the light bulb of idea lit up above my head as I embarked on this project to collect as many HRC Bears from as many locations as I can. The objective was to give it to my daughter eventually and God must have looked favourable upon me as I was blessed with a girl as my first born. --> Click here to view the photo set. 21 in all. My thanks to all the friends who had taken the time to get the bears to contribute to my collection. Faith is coming to 3 years old already. I would have given them to her earlier if not for the fact that she wasn't old enough then, to understand how all these bears come into our house. Finally, the time has come as I hand over the bears to her. I think probably it will take another few years before she can fully appreciate the journey that each bear has taken to be with her and I guess for now, mommy is going to store them into boxes until she is older. The bears belong to her from hereon forwards. Will I continue to collect more? Perhaps, if I have the chance. I totally forgot when I was in Memphis, New Orleans and Las Vegas earlier or I would have added another 3 to the collection. Oh well. Next time perhaps. wahhhhh.....so many plushies!!! And faith looks cute enough to hug too! in all seriousness, I'm sure Faith will appreciate the significance of each and every bear when she is older. then she'll have an inkling of e extent of dad's immense love for her. And his sentimentality.... I salute you, both as a fren and as another loving dad's daughter (who knows). 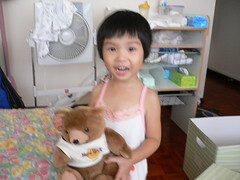 wah.. people collect tshirts, you collect bears. but at least its more unique! heh. so many bears!! so cuuuuute! Taipei HRC closed down liao, lucky you. I tried collecting the shotglasses, but gave up halfway. Uncle really got patience. Akk: I only scared she don't see it the same way. Then all that's left will be a box of dusty bears stowed deep at the back of the storeroom. ei|een: Teddy bears easier to keep and more lasting than t-shirts mah. hitomi obasan: Kowloon one also closed down. Next time, I got Vegas, I go keep a look out for HRC shotglasses for you. Zeenie: Wah... suddenly my blog machiam eBay siah... lai ah! lai ah! lelong lelong!!! Obasan: No problem. Tomorrow when you get online, I will pass you Zeenie's contact. i have a friend who collects souvenir spoons and she obsess over buying it every time we go somewhere. milktea: I only buy if I happen to pass by. Like Memphis, New Orleans and Las Vegas that I went last year. I was there but didn't get the chance to buy it. In Memphis, I forgot when I was having dinner there. In Las Vegas, it was only a short walk over but I didn't. New Orleans, er... is it still there after Katrina? OMG OMG OMG!!! What a coincidence! I have a Planet Hollywood bear collection and a Hard Rock shot glass collection too! Hey I noticed something leh. There are 3 bears with a darker tone than the rest. Why only 3. Minority leh. You racist right?! Haha. Okay I know that's quite out of the context. Hahaha. Zhebin: What nonsense! The bears are all Chinese ok! All of them have this tag that says "Made In China". Vanna: Ok lah. Not too bad considering that it was spread over so many years. I collect HRC bears too! But mine are the beanies HRC bears... easier to display.